The energy utilities industry is very conservative. The combination of long asset life and the absolute priority on safety and reliability has meant that many of the technologies have not changed radically since the 1950s. Now that is changing. Faced with the rapid shift in energy-consumption patterns, the move to green energy solutions and the evolution of communications technologies, utilities are reassessing their energy delivery strategies. This article explores the pressures that this industry is facing. It takes a look at how two of the big technology changes  smart grids and smart metering  mandate the need for a cohesive communications strategy. The changing pattern of electricity consumption, driven by the extensive proliferation of air conditioning resulting in the peak period of electricity consumption moving to the heat of summer. The move toward green energy solutions, epitomized by the European Commission, which requires (among other things) 20% renewable energies in overall EU energy consumption by 2020.1 This is not uniquely European: politicians everywhere are pressuring utilities to accommodate environmental change. Consumers and regulators alike are demanding highly reliable energy delivery, vital in maintaining an efficient national economy. Make the energy-carrying capacity of a network dynamic by measuring in real time climatic conditions such as instantaneous temperature or the cooling effect of the wind, thus enabling better network utilization. Todays distribution networks have little real-time measurement or control. Intelligent technologies will provide a far more accurate picture of demand, energy flows and network incidents, yielding a major improvement in energy reliability and asset utilization. The modern techniques of condition monitoring  monitoring the network assets for telltale signs of performance degradation  allow a very accurate forecast of equipment failures to be built. This means that assets can be replaced on a just-in-time basis, delivering significant investment savings and increased energy reliability. The benefits of intelligent energy networks are huge. They extend the lifetime of the assets, optimize power flows, increase energy reliability and enable investment to be focused where it is most needed. Smart metering is primarily intended to make consumers more conscious of energy consumption, thus leading to reduced consumption during peak periods and an overall reduction in the production of greenhouse gases. Smart metering brings its own set of challenges. This is a new application using new technologies  the smart meters, the communications network to access millions of devices and the platform to manage them. As stated above, the technologies used in the energy networks have not changed radically since the 1950s. Thus, communications networks have, in general, been built up over several decades using ad hoc, application-specific technologies, with little network sharing and, in many cases, with little management or control. Other future applications, such as closed-circuit TV (CCTV) for physical security, which will expect the latest communications protocols to be supported This results in a typical infrastructure as shown in Figure 1. 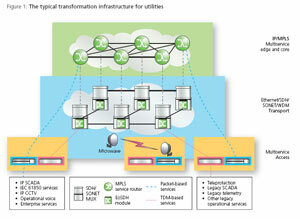 In this architecture, the multi-service optical transport layer ensures the support of both mission-critical operations such as teleprotection services, with their very tight technical requirements, and existing applications using traditional TDM-based protocols. Simultaneously, it efficiently transports packet-based data for new services and applications on the same infrastructure. The IP/MPLS layer supports new packet-based applications traffic, including substation automation, smart metering and security services with a virtualized network using Layer 2 and Layer 3 VPNs. Corporate voice, video and data applications can also be supported, with traffic management features ensuring that mission-critical operational traffic is given priority. This network architecture delivers high reliability with secure support of mission-critical operations traffic. The associated end-to-end management capability makes this network easy to manage, allowing utilities to lower the skill barrier for staff. It has allowed existing applications to be migrated and supported without disruption and has enabled systems operators to realize the consequent efficiency and reliability improvements. By starting with the high-voltage substations, a modernized multi-service TDM and Ethernet transport footprint can be established that will support all utility services. Substation transformation to Ethernet services will be driven by asset life cycle management or new plant construction. New Intelligent Electrical Devices will simply plug in to the transport footprint established earlier. Distribution automation and smart metering should be considered as complementary activities (where the regulatory regime permits). In this way, an access network can be built that supports both these applications in a single, cohesive network. This requires that the complete future access requirements are considered at the outset of the project, otherwise utilities risk perpetuating application-specific, vertically integrated networks, thereby aggravating communications inefficiency. Energy utilities are on the cusp of the first real technology change in network and metering technologies since the 1950s. This change is predicated on the requirement for a robust, reliable and flexible communications network that will support existing mission-critical applications as well as the evolution to modern smart grid and smart metering technologies. You are currently browsing the archives for the IEC61850 Ethernet-based services category.